Estimates are designed to allow you to build flexible pricing options for your clients. They're perfect for work where you may have a ballpark figure but need to build in some flexibility so when it comes to billing for the work the clients expectations have been managed. Lets take a closer look at Estimates and how they work. Estimates behave much the same way as On Completion service in that they can be billed at a later date once the work has been complete. Just like On Completion service, the estimated price can also be amended before invoicing. 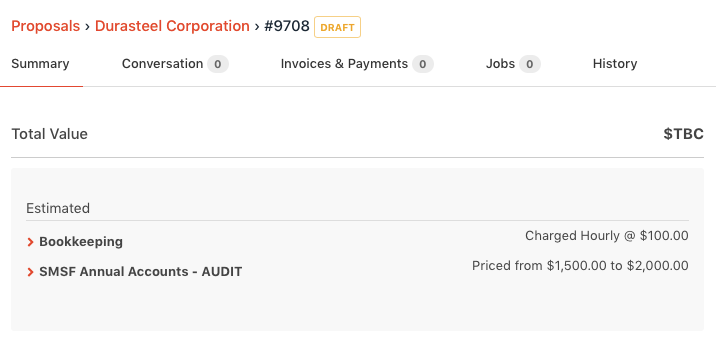 When building a proposal, Estimates can be selected as a service billing type. Selecting Estimates will present you with some billing options. There are two estimate options: Price Range and Hourly. Price range allows you to set a minimum and an optional maximum price. Depending on how this information is entered, Practice Ignition will tailor the presentation to your client. For example, if you enter a minimum price of $1000 and a maximum price of $1500, the service will be presented as "Price from $1000 to $1500". If only a minimum price is entered the presentation will remain open ended, ie; "Priced From $1000". Hourly service allow you to either enter in an hourly rate, for example $120 and this will be presented to your client as "Charged Hourly @ $120". If this amount is left blank it will simply be presented to your client as "Charged Hourly". As Estimates are variable by nature, they don't form part of the proposal total value. If the proposal contains other priced services the total value displayed will exclude any estimates services. If the proposal contains only estimates, such as the one below, the total value will display as $TBC on PI but it will appear on the client accept page as $0.00. To counter this, you can choose to hide the total value at a practice level under settings>proposals (under display options). The service summary and price breakdown that you see in Practice Ignition is the same breakdown that your client will see when they are sent the proposal.